The overt evolution of the Sumerians into a Babylonian Empire is, as we have described in the prior section on history, not altogether surprising – on the surface. However, the seeker should keep in perspective just how quickly all of this developed from seemingly nothing. It is true that societal living was originally organized around state religion, but prior to this it was culminated not by the social relationships shared between people, but by their living relationship with the earth. Where first we have loosely organized nomadic hunter-gatherers that are forced to wander about or dwell in caves, essentially rolling the dice of chance for their survival, very little time passes before the sweeping transition in Mesopotamia toward planned agricultural farming and pasturing shepherds. Available to the public for the first time ever — a comprehensive, practical, concise and economical guide to cuneiform writing, Sumerian language and its refined Akkadian use in Babylon, brought to the surface realm from the underground vaults of the world renown Mardukite Research Organization. Credited with many ‘firsts’ in the development of human history, it is the incorporation and evolution of ‘writing’ that the Sumerians can be esteemed for – something which was undoubtedly entirely necessary for the civic growth of the human world. In fact, it is only with ‘writing’ that we have any concept at all of the history of humanity; everything prior to this inception, is rightfully considered ‘prehistoric’, at least by ‘modern’ standards. 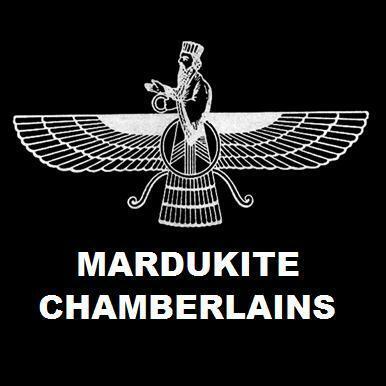 The Mardukite Research Organization (Mardukite Chamberlains) have worked diligently since 2008 actively ‘reintroducing’ the long-forgotten paradigms of the ancient world, with particular emphasis on those considered Mesopotamian, meaning Sumerian and Babylonian. A central aspect of this work, no less so today then at the time of its original use, is the ‘written word’ is critical in the preservation, relay, spiritual life and use of the ‘traditions’ as they were set down in writing. Obscure ‘clay tablets’ with worn ‘wedged writing’ that we relied so long on for the basis of our completed archives that it seems only appropriate to give the entire ‘language system’ its respects. NECRONOMICON “Liber N” began circulating among the Mardukite Chamberlains Council of Nabu-Tutu in May of 2009. Fragments and ideas first appeared as a short magazine titled: “Marduk & the Anunaki” in the spring of 2009. The final culmination of the initial work, along with its interpretation, was the direct result of the Marduk Gate Opening Ceremony — a global synchronized effort on Beltane 2009 — and the “Lapis Editions” (numbered of 60) of the NECRONOMICON were released on the 2009 Summer Solstice at a private event held at Mardukite Offices. To preserve the integrity of the Mardukite Chmaberlains materials, the Mardukite Truth Seeker Press continued to release the Year-1 core curriculum privately to its internal fellowship in handmade numbered editions. NECRONOMICON LITURGY & LORE “Liber L” (“LL”) was released July 2009 in “Ruby Editions” (numbered of 120). In addition to the Liber-L Tablet Cycles, it contains articles and teachings emphasizing a practical reconstruction of a paradigm shift toward “Babylonian” Holistic Unification. It focuses on the role and function of the ancient “priesthood”, which in history has also been connected to “divine dynastic royalty” of true Kings. NECRONOMICON GATEKEEPERS GRIMOIRE “Liber G” (“GG”) completed the core trilogy (although it was later extended to a “trilogy” of three-plus-one titles). In Liber G, the emphasis turns to the mystical (“magickal”) side of the Mardukite Babylonian Anunnaki work that more closely matched people’s “expectations” for a practical occult side to this tradition. It was released privately to the Mardukite Chamberlains in August 2009 in an “Emerald Edition” (numbered of 180). [More recently, the work from Liber G was combined with the “Book of Marduk by Nabu” Liber W and the Zagmuk/Akiti materials to form a ceremonial anthology: BABYLONIAN MAGICK – A GRIMOIRE. Concerning any reoccurring printings or editions of the Mardukite Core: it should be noted that minor revisions, corrections and additions may be found in newer editions when compared to prior ones. This is often done without comment or note, not to jeopardize consistency, but rather – and on the contrary – to consistently work towards the improvement of the “outer-form materialized published” that seems a necessary evil in relaying the universal teachings to our fellows who operate beyond the internal curtain of the Mardukite Chamberlains. I can only imagine what it must have been like for Israel Regardie cataloging the “complete system of Golden Dawn magic” – a task he spent his entire life in dedication to. Following an effort that was years — perhaps even centuries — in the making, MARDUKITE CHAMBERLAINS, the active research organization launched by Mardukite Ministries in 2009… What happened as a result could be classified as nothing short of “legendary” — a true and applicable modern mythology for the generations of a new age! Call it what you wish. During the first year of intensive research and development, the range of Mardukite work included other related published researchers, unceasing hours in abandoned corners of old libraries and museums, participation with practicing occultists and visits to “tablet collections” at universities and private collections in Pennsylvania, California and Chicago among others. The culminating results were nothing like anyone would have expected: an authentic and verifiable version of the NECRONOMICON salvaged from ancient Mardukite Babylonians using cuneiform tablet writing in the shifting desert sands of time of Mesopotamia — what we now call the Middle East. Mardukite work is unparalleled by anything already available to True Seekers. Eventually, the Year-1 Mardukite Anthology was born — the NECRONOMICON ANUNNAKI BIBLE — and it appeared to be the most complete collection of the most ancient writings on the planet that formed the very foundation of all the human traditions and beliefs that would emerge thereafter. In anticipation for the 5th Anniversary celebration, the Mardukite Truth Seeker Press specially released for the first time ever and encompassing over half of a decade of research and development: The Gatekeepers Guide to the Materials & Chamberlains Chronicles: A Modern Mardukite Memoir, New Babylon Rising: Guardians of the Gates (2008-2013 NexGen Legacy Scrapbook Edition) edited by Joshua Free with contributions from the Mardukite Chamberlains. This amazing 178-page fully illustrated companion to the Mardukite work reads like a diary, accounting for a public record of five years research and development online through the necrogate blog at mardukite.com, over three hundred YouTube videos, countless radio interviews and appearances through journeys stretching from the west coast to the east, there and back again and revealed to all in this gratuitous mardukite.com online exclusive! BABYLONIAN MAGICK is being released in special commemoration of the 5th Anniversary of the Mardukite 2009 Beltane StarGate global synchronized ceremonial observation marking the official inception of the Mardukite Chamberlains (Mardukite Research Organization), the active esoteric mystical society operating under the umbrella of the Mardukite Ministries (Mardukite Truth Seeker Press) founded by JOSHUA FREE on the Summer Solstice of 2008. BABYLONIAN MAGICK is a complete masterpiece anthology of ancient Anunnaki traditions being revived for modern use, featuring the entire “Mardukite Magick” Trilogy, including: “The Book of Marduk”, “The Book of Zagmuk” and “The Book of Gates” — amazing revolutionary underground breakthrough classics all in one volume! The world has waited long enough! Here it is! An authentic NECRONOMICON for the masses! Released in commemoration of the 5th Anniversary of the “Necronomicon Anunnaki Bible“, the Mardukite Truth Seeker Press proudly presents the new abridged compact portable travel edition of Joshua Free’s NECRONOMICON BABYLONIAN BIBLE excerpting the primary source book of the Mardukite Chamberlains Research Organization uncovered during their first active year of development in 2009! Sudden underground emergence and attention to The Book of Sajaha in 1991 reminded us of our own modern construction of an ancient wisdom tablet series — Book of Marduk by Nabu — which was entirely the development of the internal ‘Mardukite Chamberlains’ in 2009 and 2010, styled in the likeness of a ‘Prayerbook’ as might have been kept by the priests and kings of the Babylonian (Mardukite) tradition. And, of course, by “book” we mean a series of clay cuneiform tablets that could later be considered a “book” if and when converted to a bound paper medium, such as what we now produce for our readers. 1 Sajaha – My king, as you already know, there are vibrations and energy flows of different types and strength; everywhere and in everything and in everyone. 2 For everything and also for all people, there exists a permanent force in a sea of cosmic and magical vibrations and energy currents; equal to a large lake, which is composed of many different seas in itself. 3 And so everything emerges from and everyone experiences reality from oceans of vibrations and energetic flows that incessantly emits a field and also reproduces by itself; but without ability to determine anything about any of these things – often without even noticing. 4 It is participation in Games of vibration and energy currents that challenge everyone to maintain a high degree of purity to remain close to the Source of All Being – the All-as-One – from which people have become almost entirely lost since the demise of the original empire. And the intermingling descendants lost most of the old power. 5 It has come to be – in times being what they are – especially in that which pertains to the subtle vibrating Force flowing unobserved, that powers are directed only to a small extent of their potential, never really mastered or used conveniently. 6 This resulted due to the nerve-qualities of the ancestors, necessary for mastery of high power – Divine Right on Earth – being diluted among the descendants today and the pure descendants of these forces are no longer among the population. 7 The primary tool still in possession for you to still channel vibrations and energetic currents remains: the long hair of women. As such, women may become seers to divine knowledge otherwise hidden. 8 This now means that most people can not handle magical currents, although they are in the middle of them, and therefore they are like rudderless boats on an unknown sea. 1 Sajaha – Much has been, much will be, and in between what has been and what will be coming, is the kNow. 2 But this kNow is but always only a half-breath, and there is no scale by which to measure it. 3 MARDUK, surveyor of everything, who added to the people’s knowledge, the kNow, the power of eternity-in-infinity. 4 MARDUK sees the beginning and the end. In between, he sees the people on earth, they can not believe what they behold of the gods. 5 The people are the shadows of the gods. They act at their own discretion on earth. Their inheritance in the Light is to blame; for it is the seed of Darkness. 6 MARDUK sets forth the way of the walking for the Seekers. Choose your path and guide the people. 7 The compassionate eye of MARDUK gazes upon an erring race, creation of the gods. He shines upon the right way to go. He gives advice only. The Seeker is never forced on the path. 8 This is now the way of things – a way best likened to the spider’s web. It is always difficult to find only the most direct path.